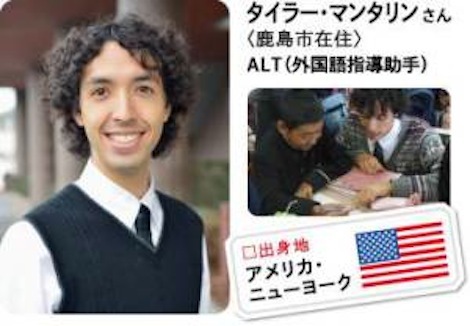 Recently, the Saga Prefectural Newsletter, ‘Shikisai’, published a short article about Tyler Kasindorf-Mantaring (2nd year ALT, Kashima BOE) for their foreigner spotlight section, which interviews foreign residents to “see Saga through international (foreign) eyes”. In elementary school, we enjoy learning English through incorporating games and singing songs with the guitar. When students use the English I taught them in their everyday lives, I feel that my work is worth doing. This is my first time living in the countryside, let alone Kyushu, but the warmth of the people in Saga is wonderful. Enjoying his life in Saga, Tyler loves partaking nori, sake and oyster barbecues. He goes to Shamisen class and said he even experienced victory at the Gatalympics. In the future, Tyler hopes to engage with education further. The warm connectedness he feels in Kashima is what sustains him today. Jump to the full Japanese article (web page) here or see the full magazine, including Tyler’s 15 minutes of fame here.